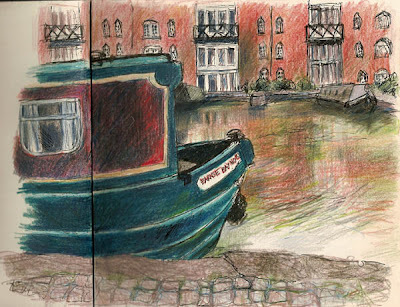 After teaching this morning I decided to make a start on my project and do some sketching at this marina on the canal. It's only a couple of miles from where I teach. These were done in an 11 inch square sketchbook, the first with the Lyra skintones set of coloured pencils and the second started off to be a pen and ink sketch with a Rotring pen - but I wanted colour, so I finished it with coloured pencils. I was there for a couple of hours and it was lovely to sit in the sunshine and enjoy the warmth. A lovely friendly lady brought me a leaflet on the history of the marina. It was a originally a wharf of warehouses for goods brought in by the narrowboats, then a woodyard, then a marina for a boat hire firm and finally they've revamped the warehouse and made them into these des res apartments. The marina was buzzing with owners working on their boats - a few chatted to me, others left me alone. The nearby Grand Union Canal goes all the way to London and this canal was built to connect with it - it's a dead end, finishing here. To get here, boats have to go up a flight of 14 locks at Foxton, to raise them up the hill to the wharf. yes, do avoid those bikes! 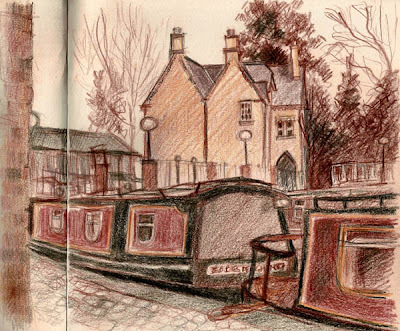 I found some very old sketches I'd done along the canal in 1995 - I'll post the pen and ink sketch of a quirky little factory building.